How to make your own Moss Pumpkins! If you’ve followed E&E for awhile, you know that I love moss balls, and I usually try and pick them up whenever I find them at a good price. They are great for all kinds of decor, or just piled up in a basket or bowl, and they are perfect for adding a touch of greenery in a display. While decorating for Fall, I started thinking about making some moss pumpkins, just like the giant moss balls I made several months ago. So I headed to Hobby Lobby to pick up some preserved moss and plastic pumpkins. Luckily, all of their Fall decor was on sale at 40% off! I picked up some loose preserved moss and also a package of the moss mat, since I wasn’t sure which one would work the best. I found some really cute plastic pumpkins with stems that look like the real deal, so I picked up several of those. I already had a large plastic pumpkin left over from last year’s Fall decor that I would use for a larger size. I started by cutting some of the moss mat into strips, approximately the length and width of one of the “sections” of the pumpkin. You can measure to be more accurate, but I just sort of eyeballed it and it worked out fine. Taking one strip, I trimmed the top and bottom so that it had more of a “feather” shape. There is a paper backing to the moss mat, so I peeled it off revealing the sticky backing. The moss mat might stick by itself, but just to be on the safe side, I added glue from the glue gun, and placed the strip over one of the sections of the pumpkin, pressing down all the edges. I worked with one section at a time, repeating the process, doing opposite sides, until I got to the last section. If some of the sections overlap, that’s fine. Here’s what it looks like when finished! I had a larger pumpkin, and I chose to use the loose preserved moss instead of the moss mat. Though it looks great, I think I like the smaller ones covered in the moss sections better. If you use the loose preserved moss, just spray the pumpkin with 3M spray glue, a section at a time, and press the loose moss into it, holding it until it sets. The moss pumpkins work perfectly for a more neutral color scheme, or to add in with other Fall colors. I love the way they look against the little white baby boos. They have a very natural, organic feel, and after the season is over, they can be stored away for next year! I’m not a bright “pumpkin orange” kind of person. I love the softer, muted tones of the season, but even if you love the traditional orange colors of Fall, these moss pumpkins will still work perfectly added into your displays and decor. I’m still looking for some of the heirloom pumpkins in the gorgeous pastel colors. So far, I haven’t found any locally, but I’m still looking! I hope you enjoyed seeing my moss pumpkins! Let me know if you are going to make some for your Fall displays! Be sure and pin it to your Fall/Autumn Pinterest boards, and we would love for you to follow us on Pinterest to see what we are pinning everyday! So, tell me, what’s your favorite way to decorate for Fall? This looks like a fun project to try. Your instructions are always easy to understand and clear. It would be great to cover up some of that glaring orange the cheaper faux pumpkins come in. You have done it again…so cute and inexpensive. Will for sure try. It’s such an easy project, Diane! And they are so cute! Thanks for commenting! Really cute! I have some of that moss matting and had found it hard to work with as a liner for a wrought iron basket, but your idea of cutting it into sections for this purpose works beautifully. I’ll try it! Thanks! What a wonderful idea! I’m making my list for my next trip to Hobby Lobby. What a fabulous idea moss pumpkins I love it. Sounds like a great craft project. I have faux pumpkins that I was thinking of getting rid of but after reading this I’ll be covering them with moss. Thank you so very much. I love your home it’s beautiful. God bless. Wonderful, Denise! Thanks for commenting! Love love love this idea Cindy! Thanks for the instructions! Cindy, Thanks for the tips. I have used the moss mat before and never knew the back peeled off. Great timing to learn, as I am going to copy you! Awesome Karen! Thanks for commenting! oh my gosh!! how did I miss these? thanks so much for sharing your process. I’ve pinned several of your pics! Thank you for pinning Debra! You are so clever! I love this – such a gorgeous woodland look! Thanks for sharing the tute – I actually have this sheet moss in my craft room – I’ll be making these asap! So fun to tour with you and bHome Cindy! Pinning! Thank you Heather! Enjoyed your beautiful blingy pumpkin! These are beautiful. So glad you put them on the Bloggertunities Share Thread. I added them to my Fri Faves today. I made some of these beautiful pumpkins today and I love them! Just wondering if your pumpkins she’d a lot? Mine are pretty messy. Did you spray them with anything to help eliminate the shedding? Hi Jessica! I haven’t sprayed mine with anything, but I think if you spray them with some spray glue and press them all the way around, it may help with shedding. Also I’ve heard that you can use hair spray to “seal” the loose pieces in! I haven’t tried the hairspray but it would probably work! 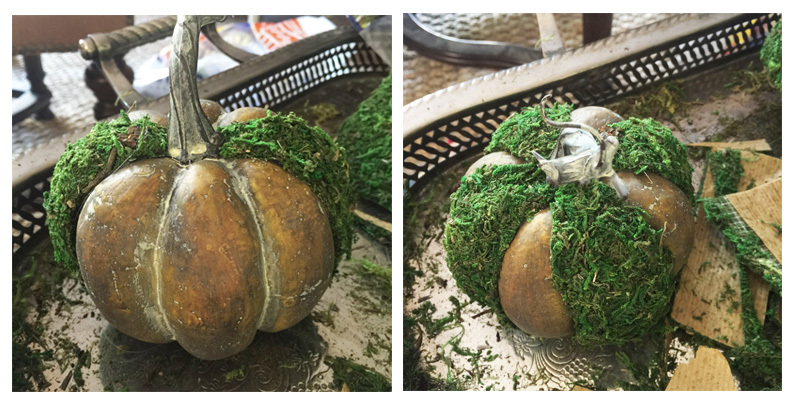 I gave not even begun decorating for fall…..
Oh how I love your moss covered pumpkins, what a great idea…. I’m being grumpy about fall starting, but this is such an adorable version of the season, and can ease me out of summer. Love it! I especially like the way you placed the mss into sections. It really ads depth and definition. Very clever indeed! Thank you Leslie Anne! The moss pumpkins were very easy to make….and would also work right through Thanksgiving! They’re so cute! What a great idea. I love the stems on the faux pumpkins too! They actually look real! Oh my gosh Cindy! !…..I can’t believe that you posted this!….I just did one!!! How funny!…..I love moss and you have always inspired me with your moss creations and how you so beautifully create a display with them….I used loose moss…I need to try one with the sections!….So, so beautiful Cindy!!! Thank you Shirley! I love moss as well, it’s a great way to add greener without having to keep a plant alive! I love the soft look of your fall decorating, I don’t like the bright colors either. Great tutorial and I am going to definitely making some! Wonderful Ellie! You will love them! Made some of your moss balls and a pumpkin! love that idea and they look great with my velvet pumpkins! always love to get inspired by you!!! Fabulous! Thank you so much Linda! Love the moss pumpkins, and you’re so right they blend in beautifully with all the different colors used for fall. I’m planning on making several…thanks for the tutorial and all the great ideas. So pretty Cindy! I found some good pumpkins at Fortnight Farms across frim Wickmans on Fort. He didn’t have a lot out yet, but I went digging. Also, the pretty blue picture we keep seeing originate from Baker’s Creek in Mansfield. They may have some. Happy Fall! Thank you so much Debbie! I might have to make a trip to Mansfield, I would love to find one like the blue one!! I love these! I am headed to Hobby Lobby today! Thanks, once again, for the inspiration! Wonderful Mary! Have fun making some moss pumpkins! Those are wonderful! I am SOOO going to have to make those now! Awesome Christine! You will love them and they are so easy! I love those and did not know about the moss mats. So, so pretty! I would never think to do this with the moss but I love the look! Thanks so much for sharing.